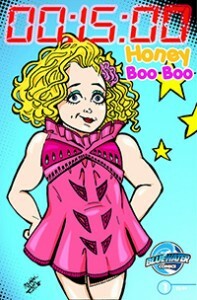 This has to be a new low; it is bad enough that I survived about 15 minutes of the Honey Boo Boo show, and about 20 minutes of Toddlers and Tiaras to go along with that, but a Honey Boo Boo comic book? This can’t end well, not at all. While I understand most people will do a lot of things for money, but Honey Boo Boo is a sign of the apocalypse, the big one, the one where Cthulhu comes screaming out of the south eastern seas to lay waste to the planet. Honey Boo Boo heralds the kind of apocalypse where God and all his minions decide to fight it out on Earth causing panic and death amongst the inhabitants. This is the where the Indian Veda’s come out in their full fury and we are exposed to space aliens who fight it out in the skies on and the planet that we live in. I am not over reacting here; Honey Boo Boo is everything that is wrong with America right now today. I’d rather go through another presidential election than have to read this comic book. I keep on flipping back to Apocalypse Now while reading this one, and I am starting to think that there is some rage building in readers much like Charlie Sheen. I am thinking those most readers by page three are looking a lot like this. And now Blue Water has started yet another line of comic books called the “15 minutes of fame” and starts off the series with Honey Boo Boo. It is so my misfortune to have to review this comic, and while this will really tick off the author, it starts badly. Sure the idea of Andy Warhol and others discussing the 15 minutes of fame idea, then leading onto a dozen or so pages of how Honey Boo Boo rose to fame during her 15 minutes. Sure, but this is really the end of popular culture as we know it, there are a lot better people out there to do a story line about 15 minutes of fame. One hit wonders of MTV would have been awesome, hell even CD Vaughn the person who murdered his entire family and got his 15 minutes of fame would have been cooler to read. With all the amazing one hit wonders, 15 minute of fame people to pick out of the line up, you have to go and grab Honey Boo Boo as the most recent and amazingly one of the most popular one hit wonders on TV today. Ok that makes sense from the money viewpoint; maybe Bluewater will sell a couple of comic books just to get an idea of how this works. However, sadly, there are better Bluewater comic books out there. I really should not be reviewing this because I am just going to give this a 3 of 5 stars, sorry folks, but this looks like it was conceived by a committee desperate to sell comic books, written and drawn poorly, with a hack subject that panders and caters to one of the most base shows on reality TV. Honey Boo Boo gives reality TV a bad name, and that is saying a lot in the horrid field that is the subject of this book. There is nothing redeeming here, you might just want to purchase it just for the amusement factor. You can get it on Kindle for 2.99, or at the Bluewater site for 3.99. But really folks, come on, Honey Boo Boo? There are millions of better people to learn about and their 15 minutes of fame.